Now here are two hot peppers that will send your taste buds screaming into a new zip code. Trinidad Moruga Scorpion vs. ghost pepper. Which one is hottest? Can you buy them fresh, or are there at least spicy products out there that use these titans of the pepper scale? Let’s stack these chili peppers side-by-side and see what we’ve got in a PepperScale Showdown. One thing is for sure, neither of these chilies are for the timid. Let’s say this outright, neither of these hot peppers should be trifled with without knowing what you’re getting into beforehand and taking the right precautions for handling. These are super-hot peppers with only the likes of the Carolina Reaper above them on the Scoville scale. 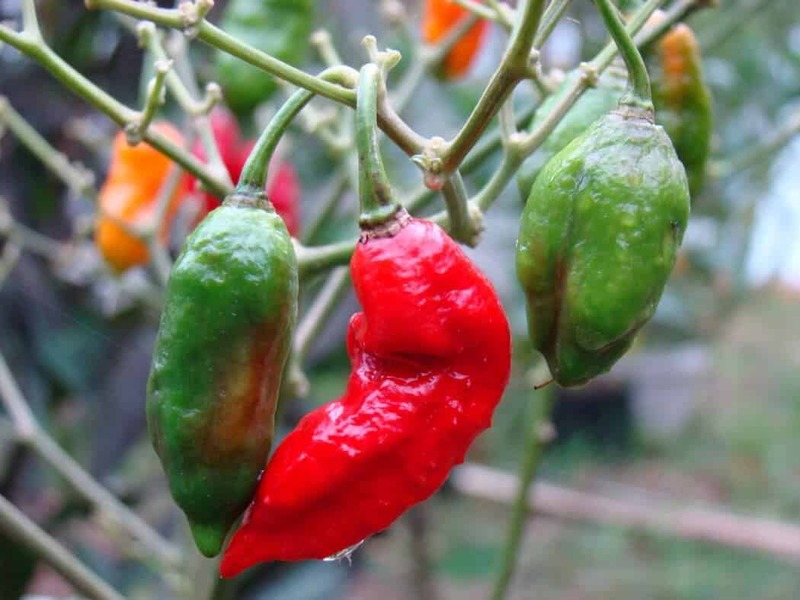 But that’s not to say there isn’t a significant heat difference between the Moruga Scorpion and the ghost pepper (also known as Bhut Jolokia). That’s crazy heat, no matter where you look. 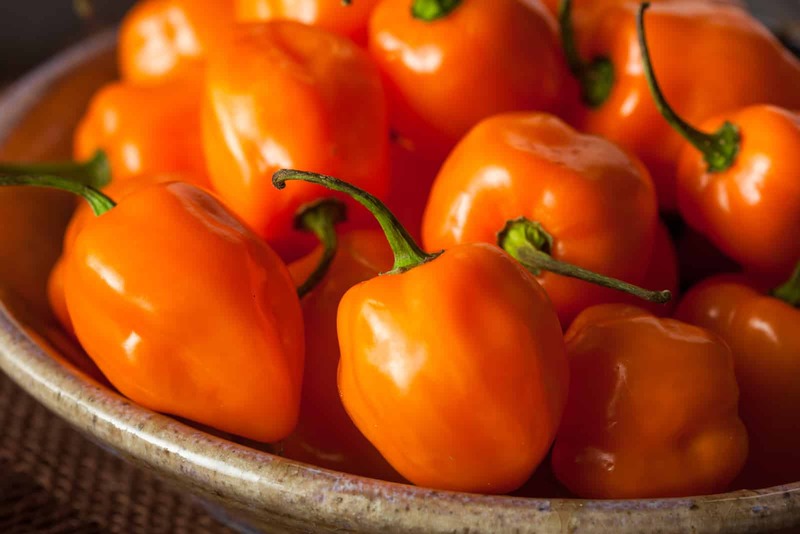 For perspective, habanero peppers are hot, and they max out at 350,000 SHU tops. 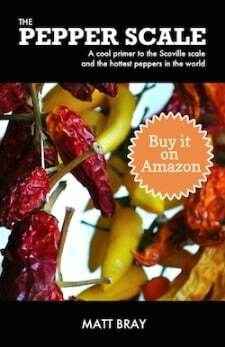 We are talking pepper heat easily double that and up to seven times the pungency. 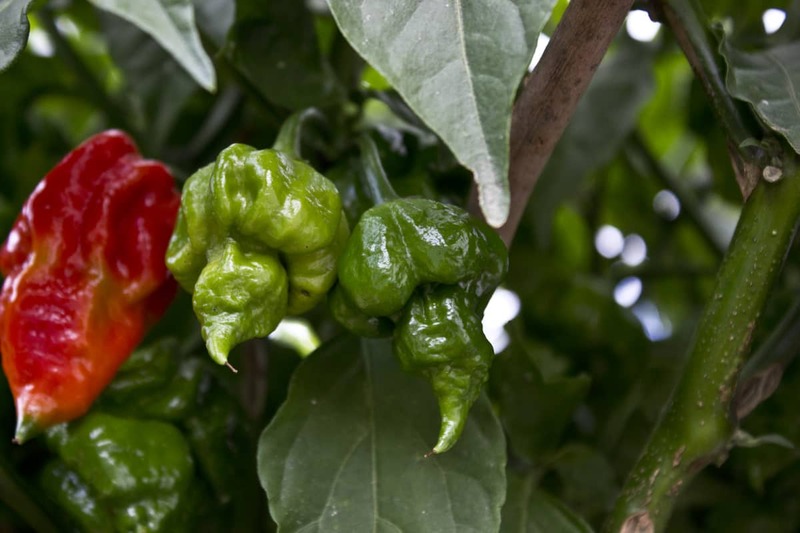 Still, the Moruga Scorpion is the no doubt heat winner between the two. An important thing to note on the heat: Ghost pepper heat is more of a slow burn than the Scorpion pepper. 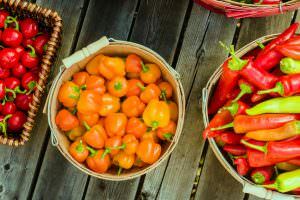 You’ll get a more immediate burning sensation from the Moruga Scorpion, whereas the ghost pepper is like a pot boiling over – it takes time for it to build. It’s a tough call to judge taste between the two. At this level of heat, the pungency is a very large part of the taste. Plus, most people will only ever taste these super-hot peppers as part of hot sauces and salsas with many other ingredients in them. 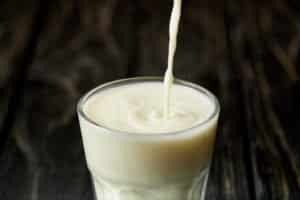 That said – both have a surprising amount of sweet fruitiness to them. 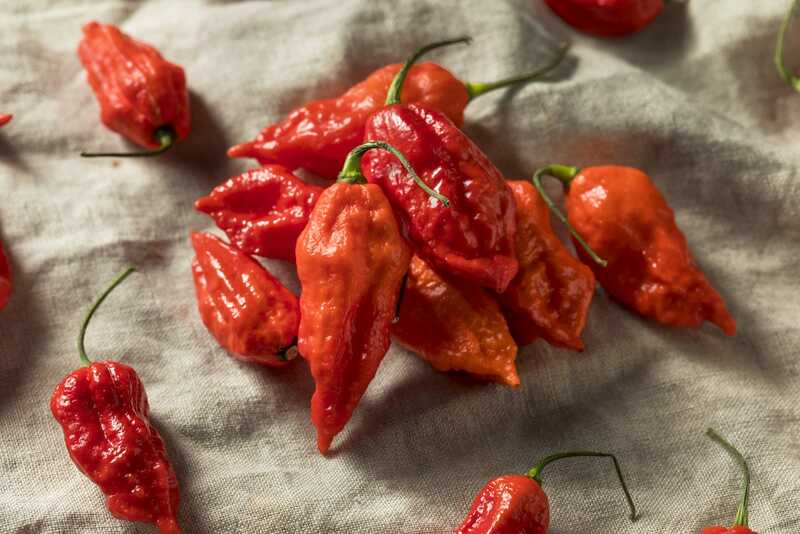 The ghost pepper’s sweetness has a touch more smokiness to it, while the Trinidad Scorpion’s taste has more of the brightness of a Thai chili pepper. Which pepper is easier to find? You can’t find either at your local store, and there’s a good reason for that. Just touching either of these peppers with your bare fingers can cause burning and numbness, even blisters. If these peppers were just sitting around at your general grocer, that’d be a lawsuit just waiting to happen. Really, both of these hot peppers are too hot for the general public; they won’t typically have the necessary knowledge to handle these peppers with care. Gloves are a must, and when cooking with them many people opt for eye protection and a protective mask just to make sure the extreme heat doesn’t get into the eyes or mouth. If you want to experiment with cooking with these peppers raw, your best bet may be to grow them yourself. You can pick up seeds and plants online and at some specialty gardening stores. Or you may luck out at specialty food shops. The ghost pepper will be easier to come across. Your other (and perhaps better) option is to pick up dried chilies to work with; those are much easier to find (and work with) for both peppers, and they are great for adding extreme heat to hot sauces and wickedly spicy meals. Which pepper has more products made from it? Now here both the Trinidad Moruga Scorpion and the ghost pepper are both winners, but one does come out on top. There are lots of extreme hot sauces, chili rubs, salsas, and more out there for both of them, but overall, you’ll see a lot more ghost pepper products around. That’s due to the slightly lesser heat, but also the rock star status the ghost pepper has acquired over time. It’s one of the most well-known hot peppers out there. 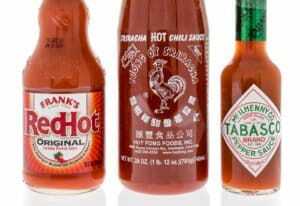 Rarely do supermarkets carry heat at this level, but again they are very available online or look for any specialty stores or hot sauce shops in your area. These two peppers contain serious extreme heat. There are differences in pungency and taste, but really neither is a pepper to take on lightly without building up your taste palate. That’s the great equalizer between the two – that mega-heat.